The Maltsers Arms, just short walk to the centre of Cwmbwrla. The Pub stands at corner of Pentregethin Road and David Street, 2012. 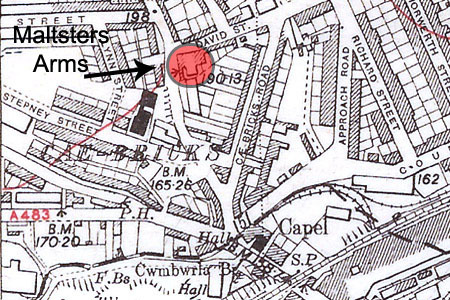 Reproduced from the (1951) OS map, without reference to the Maltsters Arms. First seen on the 1884 Ordnance Survey map. Maltsters' Arms, Wm. Griffiths, Cwmbwrla. 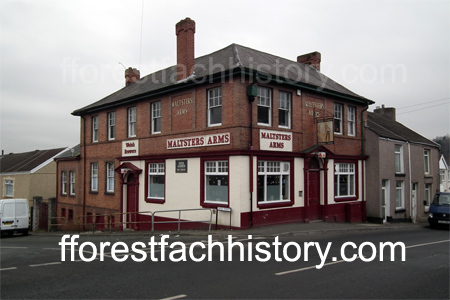 William Marriott Watts, Maltsters Arms P.H. 404 Pentregethin road. Rachael Maud Watts (Mrs), Maltsters Arms P.H. 404 Pentregethin road. Double Licence = Beer and Spirit Licences. nearby changes caused by the recent redevelopment programme." N.L. Thomas, Swansea District and Villages - Cwmbwrla p.48, printed 1969. Note: There are a number of references to Maltster's Arms in the Cambrain Archive. I only inserted information if convinced of their provenance. On Carmarthen Road at Waun wen, near Hall Street was another Maltsters.